HEATING : Also known as Bata Kumbala, this technique consists in heating the gemstone in order to improve the colour or the clarity. HEATING with ADDITIVES : The English name is Deep Diffusion Treatment. This technique consists in diffusing additives, such as beryllium, deep in the stone. 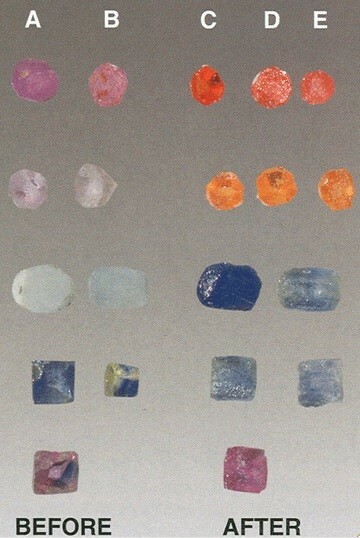 The goal here is to obtain colours that are totally different from the original and generally rare in a natural state, such as the orange colour of some sapphires. Both of these treatments are accepted by the market, but will be specified on the certificate when the stone is examined by a laboratory. On the contrary, the treatments outlined below are considered as a fraud by traders. However, some unscrupulous suppliers have no qualms about using them. Particular attention is, therefore, necessary when buying stones of a certain size. IRRADIATION : As the name suggests, some stones are irradiated. The sole reason for this is to improve the colour of the gem. This technique, besides having a limited effect over time, presents a clear health risk. FILLING : Certain gemstones have cracks that are filled with various substances such as coloured oil, resin or high-density glass. Not only does this technique hide the fragility of the stone in question, but more importantly it enhances the colour in a totally artificial way. SYNTHETIC : Gems with no inclusions are in most cases synthetic stones. In their natural state, most gems, and more particularly gemstones such as rubies, sapphires and especially emeralds have inclusions. Such pure gems are extremely rare. This is an important consideration when you invest in a stone. Do not hesitate to ask for a certificate. It is a guarantee of security. IMITATIONS : Numerous stones are used to imitate those with a much higher value. This is the case, for example, of spinel that some vendors pass off as rubies. Another common fraud consists in making doublets or triplets which are an assembly of a natural stone with either a synthetic one or an imitation. OUR ADVICE : Always ask for a certificate from an independent laboratory when you decide to invest in a gemstone. In this way you will be sure of the quality: you will be informed of its origin and of any possible treatment it may have been subject to. 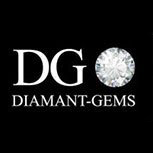 Here, you will find only quality gems of which the best specimens are systematically certified. Many gems seem to play with the light when viewed under a direct light source. These phenomena are due to the presence of different inclusions that cause interference when the light hits the stone. These generally have a cabochon cut, so as to emphasise such effects. SILK is a nest of fine needles upon which the light reflects. This creates a silky effect on the surface of the stone, whence the name. CHATOYANCY, also known as “cat’s eye”, is due to parallel needles that have the effect of a fine linear band. This, as the name suggests, resembles a cat’s eye. ASTERISM is a phenomenon caused by the presence of long, intersecting needles that create 4, 6, or 12 pointed stars. ADULARESCENCE is caused by the interaction between light and the crystals in the feldspar that, in most cases, give a bluish-white effect to the stone. AVENTURESCENCE is a sparkling reflection in the stone due to interference by light created by flake-like inclusions. IRIDESCENCE, this kind of prismatic light, is a result of refraction of light by the different crystalline layers of the gem. LABRADORESCENCE is a series of vivid colours covering large surfaces due to twinned layers of feldspar. OPALESCENCE, not to be confused with adularescence, is a milky effect that can be seen in common opals. This phenomenon is due to the slices of silica that compose opals. COLOUR SCHEMES that can be seen in precious opals are the result of diffraction of light through the successive layers of silica that constitute them. The ALEXANDRITE EFFECT that can be observed in the stone of the same name, among others, comes from the different ways that certain crystalline structures absorb daylight or artificial light.